To be alive is to be in relationship. Each of us is in relationship with other people, the environment, our surroundings, and with our self. Our bodies are the complex result of trillions of relationships among individual cells. Before we were born we were in relationship with the earth, feeling gravity and its pull. The sciences—biology, ecology, psychology, sociology, etc—are the study of relationship, how one thing relates to and effects something else. Yoga is an invitation to embody the exploration of relationship. While being in relationship is a natural part of being alive, the quality of our engagement is a choice. We can choose to be passive, allowing the world to float by. We can choose to be forceful, using the strength of our will to create or move toward what we desire. Tantra teaches that true Yoga exists between these extremes, not a passive collapse or a forceful effort, but the yield that underlies all movement. To yield is to become actively receptive to our environment and our own intrinsic mysteries of embodiment. In asana we can approach it as an active relationship with the earth; we soften and yield our weight into the earth so that we may then push and reach out in any direction. We can find it in the breath, where the yield supports the full action of the respiratory cycle. We can also yield in our personal lives, meeting others with the active receptivity that allows the moment to be fully experienced. The primary action of the practice is a yield to Source, beginning with the individual, a softening to our own experience of embodiment and unique qualities that allows a receptivity of the divine essence that unites us all. The action of yielding to the self and allowing an awareness of Source supports the discerning quality of the mind; Yoga requires that we stay continually alert, aware of the power and responsibility of our perceptions, choices, and actions. At times it is necessary to soften more deeply and allow the experience to flow. At other times it is necessary to use our discrimination and desire to move through barriers. Our practice is to explore both actions fully, understanding that they do not work in opposition to each other, but rather in concert together by creating a more expansive experience, just like the expanding, condensing and yielding qualities that are present in each breath. By maintaining consistent awareness through the yield to the self and our inherent desire to relate we can move intelligently through both asana and life. To yield is to become present, choosing to create an active and receptive engagement in the exploration of embodiment. Hi Abigail. I’ve enjoyed your piece. In particular, the following statements piqued my interest:“The sciences—biology, ecology, psychology, sociology, etc—are the study of relationship, how one thing relates to and effects something else.”“While being in relationship is a natural part of being alive, the quality of our engagement is a choice.”Your emphasis on relationship has drawn me into contemplation of the way in which connection transforms those parts that come together at the nexus we call joining. In the Sanskrit language, there is a word, “sandhi”; sandhi refers to the way in which individual words come together—combine—resulting in a transformation of the original words. In many cases, in order for two words to come together, to be joined, one word must give up a final letter and/or the next word must give up an initial letter, and often a different letter (a third letter) emerges (is brought in) such that the two original words may come together in a phonetically and grammatically harmonious (and of course standardized) fashion. (Note: this is not the official definition, nor is it a thorough explanation of sandhi, but neither does this creative usage seem to me to contradict or do disservice to the word.) The words, one my say, “yield” to one another. What are the implications? We “give up” something at the edges in order to join, enter into…unite, in the interest of coming together (com – with, together, together with): combining (interests, resources, etc. ), complimenting, communicating, communing, sometimes for the sake of experiencing the comfort, or sense of completion, brought about by complimentarity. It is a profoundly creative process, life, the fashion in which the creation emerges through relationship, the process of combining. If re- means “again,” and –lation means “to be carried or bourne,” and –ship means “a state or condition of being,” then, perhaps, “relationship” might be considered as a state or condition of being bourne, or carried, back again. (I don’t know what exactly that means, but for some reason it gives me a good feeling.) I can’t help but think, again (as in a previous blog), of pancikaranam—the five-fold process of grossification through which the world comes into being, according the science of yoga. Accordingly, the process of manifesting the creation, which we call “world” or “universe”—the entire creation—is nothing but the combination of the five elements in different proportions, and further, the five elements are nothing but combinations of sattva (luminosity/intelligence), rajas (action/movement) and tamas (form). In all relationships, in order to combine (to bring together, to connect), we give up something at the edges. We may participate consciously in this creative process of interrelationship, and how we do so, as you say in your own wonderfully unique way, is a “choice” that we are given. To interrelate is necessarily to yield. The yielding can be felt every moment of the day, in everything that one does, from breathing to eating, to sitting down and standing up again. Every moment of our lives something is releasing, giving up its border, the perimeter of its preexisting territory in order to meet, to join, to exchange with its co-inhabitants—known or unknown. The vast majority of this goes on silently, day and night, without end. In the city where I live, I see it everywhere, on the sidewalks, among so many pedestrians (so many strangers) expertly navigating the foot traffic, among the weaving bicycles and cars conventionally or non-conventionally observing lights and horns and signs, all contiguous with birds flying among the trees through windy skies and squirrels dashing to and fro between branches and bins—constant currents. Life is endlessly yielding, and the truth of this endless yielding seems to be flow. Some of the definitions of the word “yield” are: to give up; to give way (to pressure or force) and 2) to give forth; to furnish as return. 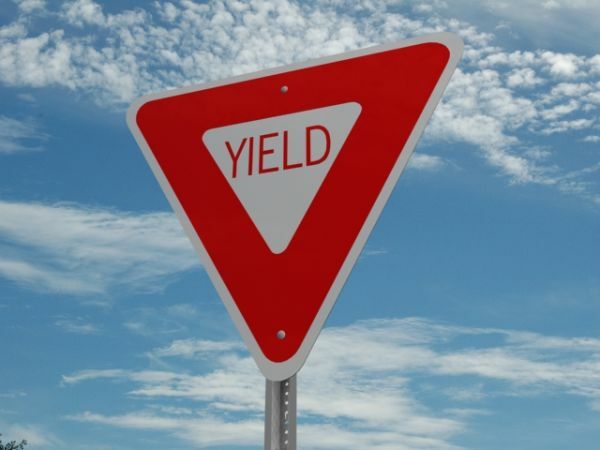 (The etymology of the word "yield" seems to be Germanic. The Germanic word geldan means: to be worth 2) to repay, to return 3) to cost, to concern 4) to return, render, surrender and 5) to give way.) I got to thinking about yielding as one of nature’s most basic, and most generous, principles, and furthermore, as one of its most compassionate teachings. Yielding is basically “a two-way street”: each consciously participating member gives up something willingly, gives way, and is furnished in return. This strikes me as a truth apparent in all healthy relationships—a balanced movement of give and take. I think of it as mutual interdependence. A “healthy” relationship is a sustainable relationship. With respect to asana practice, a sustainable posture is one in which there is constant cycling—continuous exchange—of resources, of energy, between all participating members of the body—all membranes inspiring and expiring “in concert,” as you say, alternating between work and rest, heightened stimulation and tranquility. A sustainable posture is a healthy posture; it is, I believe, one that does not exhaust the resources of any isolated member(s) of the body’s community. My pleasure, Abigail! I look forward to your future posts.